The New 3DS is faster and bigger with improved hardware and a better battery life. While the New 3DS is slightly heavier, the New 3DS XL is actually lighter. The battery life for the New Nintendo 3DS is from 3.5 to 6 hours, while the battery life for the New Nintendo 3DS XL is from 3.5 to 7 hours. Here's how that battery life stacks up against the old 3DS, which has a battery life of 3 to 5 hours. And how the battery life of the New 3DS XL compares to the old 3DS XL with a battery life of 3.5 to 6.5 hours. 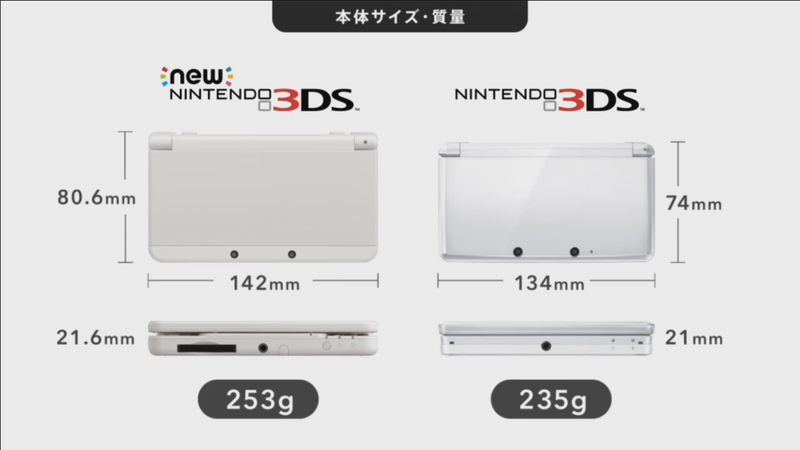 At the top of this story, you can see how the New Nintendo 3DS's measurements compare to the old one. Here, you can see how they compare on both versions of the 3DS XL.